Its golden-amber hue and deep, dark Peachseed jigged handles allow the beauty of the natural bone to shine through. The Case artisans flame each handle by hand to give the dark contrast that this handle is known for by generations of Case collectors. Features Tru Sharp surgical steel blades mirror polished and honed by hand to a razor sharp edge. Genuine Hand Fired Bone Handle. 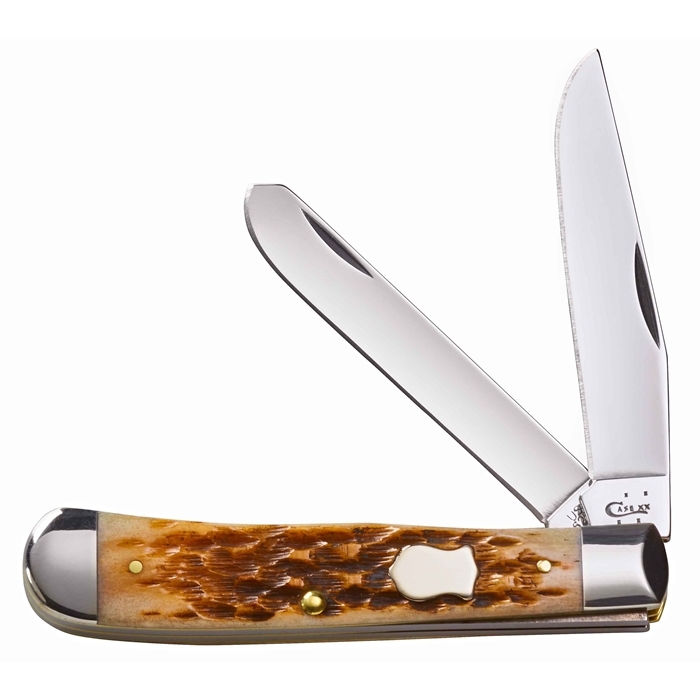 Make this a very special gift with a name engraved on the blade, or initials on the bolster. This item with engraving ships within 48 hours! The historic badge shield was the shield used by Case Brothers at the turn of the 20th century. The company’s rich history began in 1889 when four brothers - William Russell (W.R.), Jean, John, and Andrew Case(a.k.a. “The Case Brothers”) began fashioning knives and selling them along a wagon trail in upstate New York. W.R.’s son, John Russell (Russ) Case, a former salesman for the Case Brothers brand, launched W.R. Case & Sons around the turn of the 20th century. We can also engrave 3 initials or a date or age on the shield in a horizontal format. Name to be engraved on 1st blade - Please be sure a font is selected. Please note that you must select which font you would like to have engraved. Engraving on 2nd blade - Please be sure a font is selected. Initials on Bolster - Please be sure a font is selected. Once you have selected the option to engrave on the shield you can enter the Initials - 3 Characters Max or Age/Year/Years of Service/Years of Marriage - 4 Characters Max. We will engrave in a horizontal format. The font will be block.